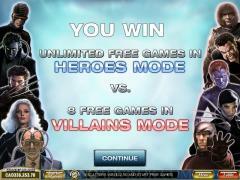 X-Men is a branded Marvel slots game released by Cryptologic. This Marvel slot is unique because it does not figure one single super hero but a collection of them grouped under the banner of X-men. 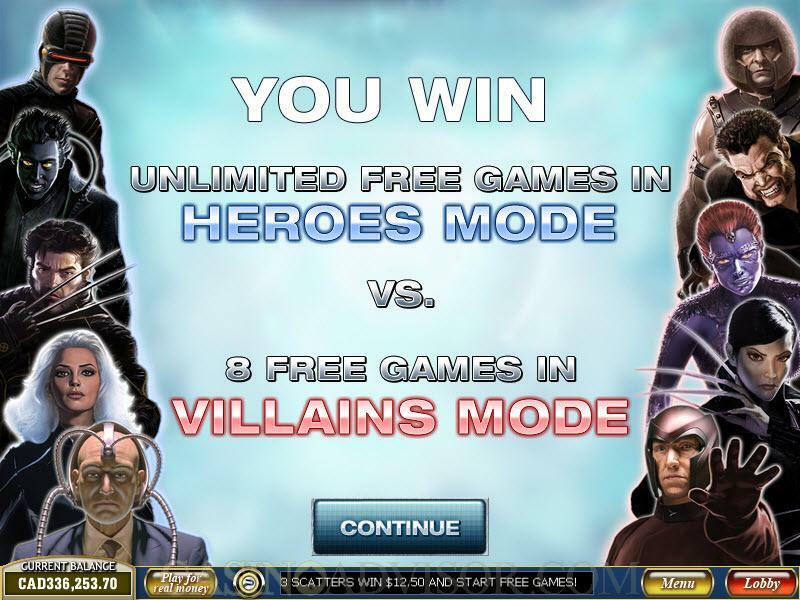 The slot game also figures some prominent enemies of the X-Men. The X-men are young mutants who have been trained by Professor Xavier at the Xavier Institute for Higher Learning to fight for humanity. They are called X-men because they possess the X-Gene, which gives them their super powers. 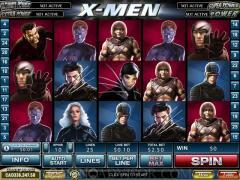 The X-Men who are represented in this slot game are Xavier, Wolverine, Storm, Cyclops, Jean Grey and Night Crawler. Rogue and Gambit, who began as villains but later turned good, are also included. The enemies are the Brotherhood of Mutants led by Magneto and include Mystique and Sabretooth. Xavier is the wild symbol and the logo for the Xavier Institute is the scatter symbol. 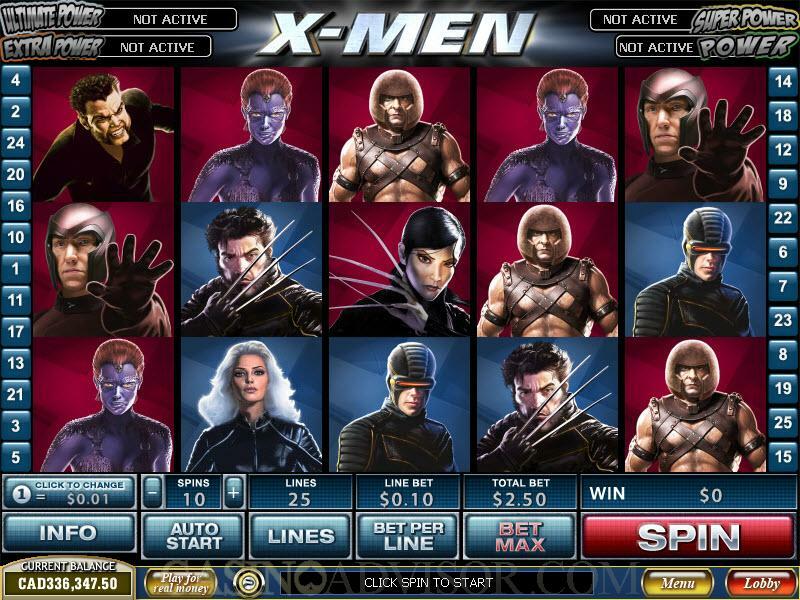 X-Men is a 5 reel and 9 payline online slot game. The number of coins that can be wagered per line is restricted to one. The players only get to choose the coin denomination and the number of paylines. These are done by operating the UP and DOWN arrows next to the indicators. The coin denominations available in X-Men are somewhat limited. The denominations offered are 0.05, 0.10, 0.25, 1.00, 2.00 and 5.00. Low rollers will miss the 0.01 coin size. By clicking the Spin button the reels can be activated with the chosen coin size and number of paylines. By clicking the Bet Max button the reels can be activated with the chosen coin size and all 9 paylines. Xavier is the wild symbol. It does not multiply payouts but offers the largest fixed jackpot of 7500 coins. The Xavier Institute logo is the scatter symbol. In X-Men the scatter symbols also have to be aligned left to right on the reels. They do not count if they are scattered anywhere on the reels as is the usual practice. The scatter symbol offers scatter payouts and triggers the bonus game on the second screen. In this game 4 trouble spots are chosen and the player has to send one of the X-Men to each spot. There the superhero battles an evil adversary. Each has a life meter and the one whose life meter gets depleted first loses. If the superhero loses then the player gets a consolation award and an award based on how much of the adversary’s life meter has been taken. If the superhero wins then he gets an award based on the amount of life left in his or her life meter. X-Men shares the Marvel Slots three level progressive jackpot consisting of the Marvel Hero jackpot, the Super Hero jackpot and the Hero jackpot. The jackpots are hit randomly but the chance of hitting the jackpot is greater with larger wagers.